Listed below, with brief descriptions, are all of Pope John Paul II’s encyclicals through April 2003, followed by selected Apostolic Letters, Constitutions, Exhortations, and Motu Proprio. The mystery of redemption and the situation of the redeemed person in the modern world are themes of the encyclical. Human rights and dignity, religious liberty and the quest for life’s meaning in a world of technological and scientific breakthroughs are examined. The church’s fundamental function in every age, Pope John Paul II states, is “to point the awareness and experience of the whole of humanity toward the mystery of God.” Pope John Paul also describes the vital role of the Virgin Mary, calls for appreciation of priestly celibacy, and discusses the task of theologians. conversion of the human heart, Pope John Paul II writes, “is brought about by the influence” of the Holy Spirit working through the conscience. “Mary belongs indissolubly to the mystery of Christ, and she belongs also to the mystery of the Church from the beginning, from the day of the Church’s birth,” Pope John Paul II writes in his sixth encyclical, written in connection with the Marian year which began on Pentecost Sunday, 1987. The encyclical addresses the Blessed Mother’s “importance in relation to women and their status”; ecumenism and Mary; the relation of Mary and Jesus Christ; Mary’s presence in the pilgrim church; Mary as a model of faith; and other questions. Written to commemorate the 20th anniversary of Pope Paul VI’s social encyclical, Populorum Progressio, Pope John Paul II’s seventh encyclical, on social concerns, points to a widening gap between the world’s rich and poor. It calls for recognition of the moral dimension of interdependence along with a concept of development that is not merely economic. Pope John Paul reaffirms the continuity of church social teaching as well as its constant renewal. Pope John Paul II’s eighth encyclical, subtitled “On the Permanent Validity of the Church’s Missionary Mandate,” stresses the urgency of missionary evangelization. The encyclical examines the new frontiers for missionary activity in modern cities or some traditionally Christian areas needing re-evangelization, while emphasizing the continued importance of a mission ad gentes—to the nations. Pope John Paul rejects any views of salvation and mission that would focus on humanity’s earthly needs while remaining “closed to the transcendent.” The relationship of missionary activity to ecumenism and interreligious dialogue, to the development of peoples, to situations in which Christians are the minority and to inculturation of the faith, along with the role of the communications media in evangelization, are among points discussed in the encyclical. This ninth encyclical was issued for the centenary of Pope Leo XIII’s social encyclical Rerum Novarum. It was written in the wake of communism’s collapse in Eastern Europe and looks to the new things (rerum novarum) influencing the social order. Pope John Paul II examines strengths and weaknesses of different forms of capitalism and the free market, and he takes up such themes as work, unions and wages, unemployment, profit, atheism, class struggle, freedom and private property. In the 10th encyclical of his papacy, Pope John Paul II treats the foundations of moral theology—“foundations which are being undermined by certain present-day tendencies.” Pope John Paul expresses concern that an “attempt to set freedom in opposition to truth, and indeed to separate them radically, is the consequence, manifestation and consummation of another more serious and destructive dichotomy, that which separates faith from morality.” The encyclical reaffirms “the universality and immutability of the moral commandments, particularly those which prohibit always and without exception intrinsically evil acts.” It expresses concern for helping present-day culture rediscover the bond between truth, freedom and the good. Steps toward mobilizing a “new culture of life” are outlined in this 11th encyclical of Pope John Paul II. The fact that laws in many nations do not punish practices opposed to life, and even make them “altogether legal, is both a disturbing symptom and a significant cause of grave moral decline,” he writes. Pope John Paul says that “no human law can claim to legitimize” abortion and euthanasia and that, through “conscientious objection,” there “is a grave and clear obligation to oppose” laws that do so. He writes, “I confirm that the direct and voluntary killing of an innocent human being is always gravely immoral” (No. 57), and declares “that direct abortion, that is, abortion willed as an end or as a means, always constitutes a grave moral disorder” (No. 62). And, he says, “I confirm that euthanasia is a grave violation of the law of God” (No. 65). Ecumenism is not an “appendix” added to traditional church activity, but “an organic part of her life and work, and consequently must pervade all that she is and does,” Pope John Paul II writes in his 12th encyclical, titled Ut Unum Sint. It examines the papacy’s role as “visible sign and guarantor” of unity, acknowledging that the bishop of Rome “constitutes a difficulty for most other Christians, whose memory is marked by certain painful recollections.” The encyclical discusses ecumenism’s history, sacramental sharing, dialogue’s nature, reception by the churches of dialogue-group agreements, common prayer, joint service, ecumenical translations of the Bible, doctrine, areas needing “fuller study before a true consensus of faith can be achieved” (No. 79) and other matters. This 14th encyclical focuses on the “relationship between faith and philosophy.” Pope John Paul II says it is his “task to state principles and criteria” necessary for restoring “a harmonious and creative relationship between theology and philosophy.” The Church, he says, “has no philosophy of its own nor does she canonize any one particular philosophy in preference to others.” Pope John Paul says: “The content of revelation can never debase the discoveries and legitimate autonomy of reason. Yet...reason on its part must never lose its capacity to question and to be questioned.” The encyclical examines the relationship of philosophy and God’s word; metaphysics and theology; truth and freedom; human experience and philosophy; the ongoing value of philosophy in a scientific world and other topics. This letter, written on the occasion of the Marian year, represents Pope John Paul II’s response to a recommendation of the 1987 world Synod of Bishops. Pope John Paul says that “both man and woman are human beings to an equal degree, both are created in God’s image.” He explores the attitude of Jesus toward women in the Gospels which show that “in the eyes of his contemporaries Christ became a promoter of women’s true dignity and of the vocation corresponding” to it, the pope writes. Some of his themes include the exploitation of women, marriage, motherhood, the value of religious consecration, virginity, women who suffer, distinct feminine gifts and why women cannot be ordained to the priesthood. In this apostolic letter on the churches of the East, Pope John Paul II says, regarding the Orthodox churches, “We feel the need to go beyond the degree of communion we have reached.” The letter acknowledges that with the fall of atheistic communism in Central and Eastern Europe “Christian brothers and sisters who together had suffered persecution are regarding one another with suspicion and fear just when prospects and hopes of greater freedom are appearing.” Pope John Paul comments that “the time has come to suffer, if necessary, in order never to fail in the witness of charity among Christians.” Pope John Paul also discusses the East as a model for inculturation, monasticism; the need to improve “knowledge of one another.” In addition to knowledge, he feels that “meeting one another regularly” is vital. Pope John Paul II highlights “the duty to attend Sunday Mass,” and he says “efforts must be made to ensure that the celebration has the festive character appropriate to the day commemorating the Lord’s resurrection.” Pope John Paul comments, “In considering the Sunday Eucharist more than 30 years after the council, we need to assess how well the word of God is being proclaimed and how effectively the people of God have grown in knowledge and love of sacred Scripture.” The pope emphasizes that “the Mass in fact truly makes present the sacrifice of the cross.” And, he says, the Eucharist’s communal character “emerges in a special way when it is seen as the Easter banquet, in which Christ himself becomes our nourishment.” Pope John Paul writes that “the Eucharistic celebration does not stop at the church door”; and he discusses Sunday assemblies without a priest, singing, the relations of Sunday to Sabbath, homilies, the sign of peace and other matters. This letter announced the start of a year of the rosary, running from October 2002 to October 2003. In it, Pope John Paul II recommends the addition of five new mysteries of the rosary—the mysteries of light—“to bring out fully the Christological depth of the rosary.” These mysteries are: Christ’s baptism; his self-revelation at Cana; his proclamation of the kingdom of God; his transfiguration; and his institution of the Eucharist. The apostolic letter includes numerous suggestions for praying the rosary in ways that foster contemplation of the mysteries of Christ. Establishes norms for ecclesiastical universities. Promulgates the revised Code of Canon Law. Establishes norms for the operation of the Roman Curia. Divided into two main parts, this apostolic constitution first discusses the Catholic university’s identity and mission, and the second part is a presentation of general norms under seven headings for “all Catholic universities and other Catholic institutes of higher studies throughout the world.” The norms become effective the first day of the 1991 academic year. Issued on the publication of the Catechism of the Catholic Church prepared following the Second Vatican Council. [It has become customary for the Pope to issue an apostolic exhortation after meetings of the Synod of Bishops. This is true of this document and the others listed below which follow synodal meetings.] 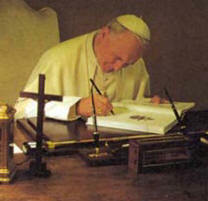 Pope John Paul II’s first apostolic exhortation was on catechesis or religious instruction. It followed on the fourth general assembly of the Synod of Bishops held in October, 1977, which Pope John Paul attended before his election. The exhortation emphasizes the “Christocentricity” of all catechesis and defined its aim as developing, “with God’s help, an as yet initial faith, and to advance in fullness and to nourish day by day the Christian life of the faithful, young and old.” Among the topics covered are the need for systematic catechesis, the content of catechesis and its integrity; suitable pedagogical methods; catechesis of various age groups and of the handicapped; catechesis and theology; and the responsibility of bishops, priests, men and women religious, lay catechists, schools, and families for catechesis. This document was written after the 1980 international Synod of Bishops. Four general tasks of the family, discussed by the synod, are also discussed by Pope John Paul II: to form a community of persons; to serve life; to participate in society’s development; and to share in the life and mission of the Church. Among the topics discussed are: the roles of women and of men in families, marriage as a sacrament, the rights of children and of the elderly, the role of parents in the education of children, family planning and birth control, prayer, marriage preparation, and the pastoral care of families after marriage, and other issues. Writing after the 1983 Synod of Bishops, Pope John Paul II discusses, among other topics, the sacrament of penance; catechesis on reconciliation and penance; social sin; fasting and almsgiving; confessors; and the sense of sin and reconciliation within the church. Writing after the 1987 world Synod of Bishops, Pope John Paul II says that the vocation and mission of the laity springs from baptism. The dignity of the laity, their participation in the Church’s life as a communion, their coresponsibility in the Church’s mission, their formation, roles of women and men, parish life, and associations of the laity are among points discussed. Writing after the 1990 world Synod of Bishops, Pope John Paul II speaks of a scarcity of priestly vocations in parts of the world and calls for direct preaching on the mystery of vocation; analyzes factors within society that hinder vocations, while also pointing to factors that “offer favorable conditions for embarking” on a vocation; reaffirms the value of priestly celibacy in the Western Church; discusses major and minor seminaries, cooperation with the laity, how movements and lay associations foster vocations, affective maturity among priests, ongoing formation, older priesthood candidates, roles of laity and women in priestly formation, among other topics. consecrated life; religious garb; the founding charisms of institutes; women; initial and ongoing formation of consecrated persons; community life; authority’s role; the relationship of religious superiors and bishops, and their need for ongoing dialogue; roles within the local church; cooperation with the laity; issues related to participation in ecclesial movements; roles of priests and brothers in mixed institutes; promotion of vocations; the prophetic character of consecrated life; the ecumenical contribution consecrated institutes can make; their role in education, including colleges and universities; service of the poor; and many other concerns. Writing after the Fall 1997 Special Assembly for America of the Synod of Bishops, Pope John Paul II says that in America “areas in which it seems especially necessary to strengthen cooperation are the sharing of information on pastoral matters, missionary collaboration, education, immigration and ecumenism.” Pope John Paul focuses in a special way on new evangelization called for by “the new and unique situation in which the world and the church find themselves at the threshold of the third millennium, and the urgent needs which result. Pope John Paul examines many issues of church life - for example, spirituality and conversion; Scripture study, popular piety and inculturation of the Gospel; the role of bishops, priests, deacons, those in the consecrated life and lay people, the need to foster priestly vocations, youth ministry, ecumenism and parish renewal. He applies church social teaching to numerous challenging social issues such as corruption, the drug trade, the environment, the arms race, globalization, Third World debt and torture, and he focuses on the human rights of all, from the unborn to the aged. Writing after the Spring 1998 Special Assembly for Asia of the Synod of Bishops, Pope John Paul II focuses on how the church’s mission of evangelization can be carried out in Asia, where nearly two-thirds of the world’s population lives and where, with the exception of the Philippines, Christianity is a minority religion. Pope John Paul says that “there can be no true evangelization without the explicit proclamation of Jesus as Lord” and that “proclamation that respects the rights of consciences does not violate freedom, since faith always demands a free response on the part of the individual.” He also discusses inculturation; church social teaching; poverty and oppression; economic growth; the arms race; government corruption; religious freedom; the formation of evangelizers; basic ecclesial communities; interreligious dialogue; ecumenism; priests; consecrated life; the laity, and numerous other concerns. Pope John Paul II wrote this exhortation in response to the Special Assembly of the Synod of Bishops for Oceania in the Fall of 1998. In it Pope John Paul says that the need for a new evangelization “is the first priority for the church in Oceania” and “the time is ripe for a re-presentation of the Gospel to the peoples of the Pacific.” The apostolic exhortation discusses the effects of modernization in Oceania; the role of catechists; ecumenism and interreligious understanding; fundamentalism; church social teaching; the sanctity of life; sexual abuse by some clergy and religious; indigenous peoples; the importance of Scripture; liturgy; women’s roles; the roles of priest and deacons; the consecrated life; the laity and other matters. [The words motu proprio can be translated “on his own initiative.” They refer to documents originating with the pope himself, usually embodying some form of executive action.] In this document Pope John Paul II urged followers of the schismatic French Archbishop Marcel Lefebvre to remain “united to the vicar of Christ in the unity of the Catholic Church,” cautioning that “everyone should be aware that formal adherence to the schism is a grave offense against God and carries the penalty of ex-communication decreed by the church’s law.” Pope John Paul also established a commission to facilitate the full ecclesial communion of those who have been “until now linked” to Lefebvre’s society and said that “respect must everywhere be shown for the feelings of all those who are attached to the Latin liturgical tradition, by a wide and generous application” of Vatican directives for use of the Tridentine Mass. With this letter, Pope John Paul II made an addition to canon law to include the second clause in the profession of faith published in 1989 by the Holy See’s Congregation for the Doctrine of the Faith concerning teachings proposed “definitively.” The letter underlines the assent required when dealing with church teaching proposed definitively, and it provides for applying penalties to those who deny definitive teachings. Pope John Paul II affirms the importance of national and regional conferences of bishops called for by the Second Vatican Council. The letter discusses collegiality; the individual bishop’s role; membership in bishops’ conferences and their procedures. Part of it is devoted to the doctrinal competence of bishops’ conferences stating that unanimous doctrinal declarations by a conference oblige the faithful of that territory “to adhere with a sense of religious respect to that authentic magisterium of their own bishops.” If there is not unanimity, a recognitio or approval by the Holy See is necessary before the faithful of that territory would be obliged to adhere to a doctrinal declaration. Pope John Paul II stresses that general absolution is “exceptional in character” and the “the church has always seen an essential link between the judgment entrusted to the priest in the sacrament and the need for penitents to name their own sins, except where this is not possible.” Pope John Paul appeals to bishops and priests “to undertake a vigorous revitalization of the sacrament of reconciliation.” Pope John Paul clarifies the nature of the conditions in which general absolution may be used.